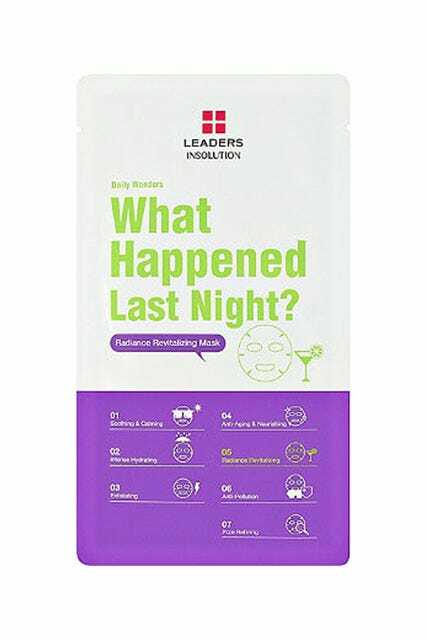 Refinery29.com: "Do Hangover Beauty Products Actually Work?" Do Hangover Beauty Products Actually Work? I was having a first date at a rooftop bar in Midtown. Since the wines-by-the-glass were ridiculously expensive, I ordered a martini and he grabbed a beer. After tasting mine, though, he wanted a martini, too, so we ordered a second round. Delicious, but refuses-to-plan-ahead-Maria forgot to eat dinner — and half-a-dozen olives do not a meal make. The next morning, I woke up feeling like I'd been hit by a train, so I applied my What Happened Last Night? mask and left in on while I packed my lunch and straightened up my apartment. I was surprised how thin this sheet mask was. Plus, it was slightly stretchy and really hugged the contours of my face, something that thicker face masks I've tried have had trouble doing. When I peeled it off after 20 minutes, I was floored by how radiant my face was. My skin felt dewy, refreshed, and there wasn't a lick of redness to be seen. I rubbed the leftover serum into my face, slapped on some facial oil, did my makeup, and ran out the door to breakfast. I'd call this mask a keeper. Leaders Daily Wonders What Happened Last Night? Revitalizing Mask, $4, available at Ulta.